Licht colours indicate kintras that dae nae observe simmer time: Algerie, Belarus, Iceland, Roushie, Tunisie. 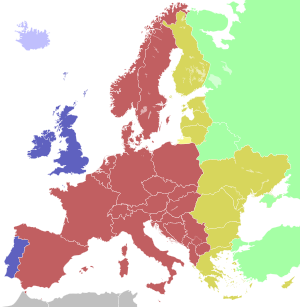 Eastren European Time (EET) is ane o the names o UTC+02:00 time zone, 2 oors aheid o Coordinatit Universal Time. It is uised in some European kintras that an aa uise Eastern European Simmer Time (UTC+03:00) as a simmer daylicht savin time. This page wis last eeditit on 6 Apryle 2014, at 23:27.